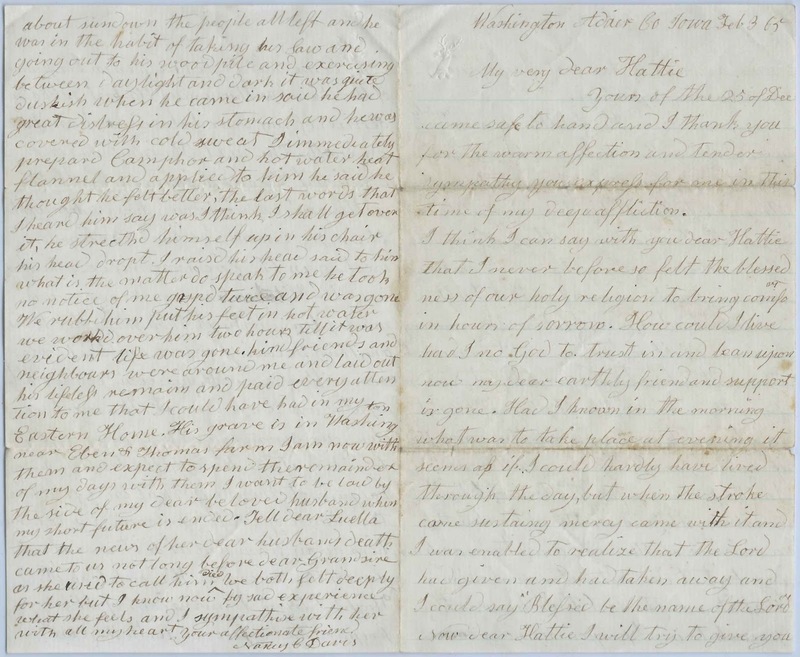 Letter, dated February 3, 1865, to Hattie from Nancy (Cook) Davis, wife of Reverend Increase Sumner Davis. 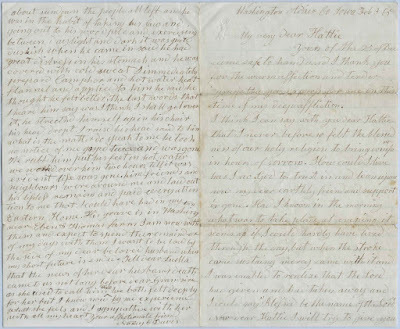 The purpose of the letter was to thank Hattie for her expression of sympathy and to give her an account of Rev. 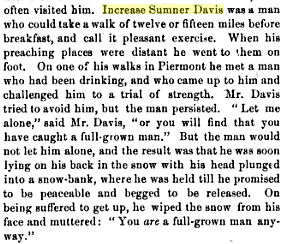 Davis' last days; he had died in November of 1864. The letter is one sheet, folded into four panes. [Click on an image to enlarge it.] A transcription appears at the end of this post. Nancy (Cook) Davis was born September 25, 1795 at Newton, Massachusetts, the daughter of Jonathan and Temperance (Whitney) Cook. In 1818, I think on May 14, Nancy married Sumner Increase Davis, son of Ebenezer and Lucy (Aspinwall) Davis. Sumner was born on May 6, 1797 at Brookline, Massachusetts, though I found another record having him born on the same day in 1796. He was ordained a minister at Dorchester, New Hampshire, October 9, 1828. Rev. Davis' occupation took him to several states, including, eventually, Iowa, where he died in November of 1864. I found different dates of death in November of 1864 for him, and even records with a different year of death. Unless Nancy misdated her letter, his death in November of 1864 seems plausible. Hopefully a reader in the know will weigh in on these discrepancies. I found an interesting description of Rev. Davis from The History of Middlesex County, Massachusetts, with Biographical Sketches of Many of its Pioneers and Prominent Men, Volume III, compiled by D. Hamilton Hurd and published in Philadelphia, Pennsylvania, in 1890 by J. W. Lewis & Co.
Nancy (Cook) Davis died November 25, 1884 at Washington, Iowa, and is buried with her husband and sons Ebenezer and Thomas at Witt Cemetery, Bridgewater, Iowa. If you have corrections and/or additions to the information above, please leave a comment or contact me directly. I'd like to know more about the Luella referenced in the letter. Yours of the 25 of December came safe to hand and I thank you for the warm affection and tender sympathy you express for one in this time of my deep affliction. I think I can say with you, dear Hattie, that I never before so felt the blessedness of our holy religion to bring comfort in hours of sorrow. How could I live had I no God to trust in and lean upon now my dear earthly friend and support is gone. Had I known in the morning what was to take place at evening it seems as if I could hardly have lived through the day, but when the stroke came sustaining mercy came with it and I was enabled to realized that the Lord had give and had taken away and I could say "Blessed be the name of the Lord". Now, dear Hattie, I will try to give you some account of his last days and his sudden departure.